Select a section heading below to browse the report. Use the navigation menu at the bottom of this page to visit the Center highlights. As the Center for the Study of Tobacco and Society enters its 20th year at the University of Alabama, I am proud to report that 2017-2018 has been the most productive in the Center’s history. The creation of two full-time archival positions has led to the appointment of a talented collection manager, Mary Clare Johnson (MLIS, University of South Carolina) and an innovative digital archivist, Kevin Bailey (Masters in Public History, University of North Alabama). 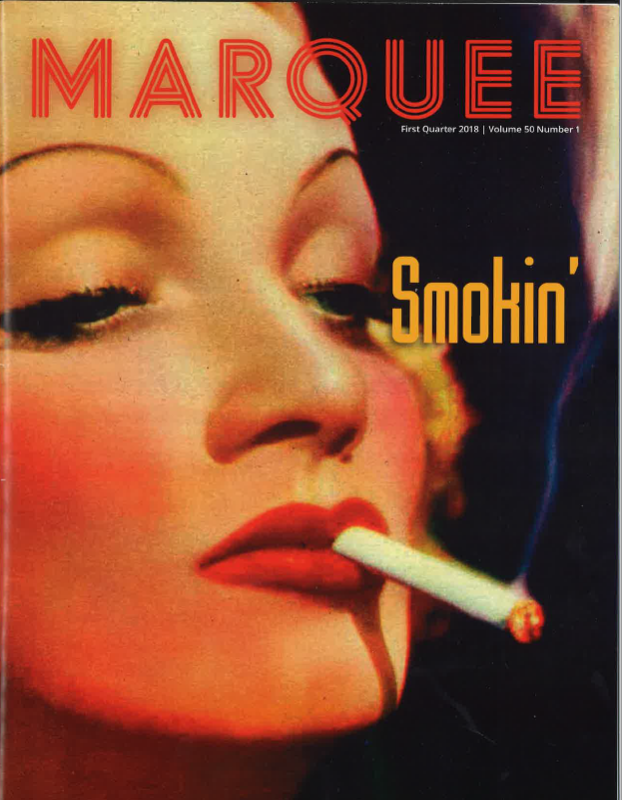 Together we have accelerated the digitization of material from our vast historical collection on the tobacco industry, cigarette marketing, and the anti-smoking movement, and we have revised the collection into 54 subject categories. A renewed emphasis on online exhibitions has led to the release in April of the Center’s twelfth and largest exhibition, Big Tobacco in the Big Apple: How New York City Became the Heart of the Tobacco Industry…and Anti-Smoking Activism, which was begun three years ago by former collections manager Natalie Thompson (MLIS, University of Alabama). 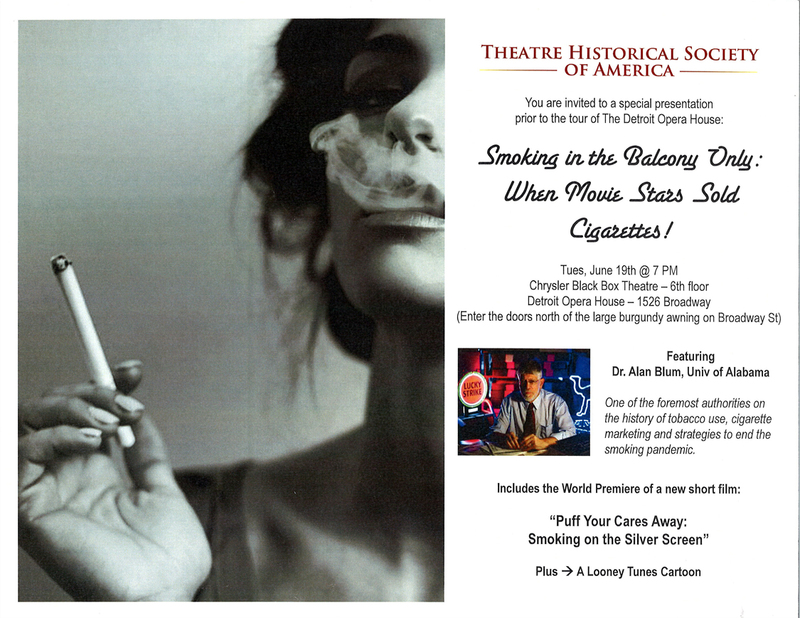 The year also marked the creation of an updated presentation and soon-to-be-released exhibition, Smoking in the Balcony Only: When Movie Stars Sold Cigarettes, and an original film, Puff Your Cares Away…, which premiered at the annual conference of the Theatre Historical Society of America in June. Three more exhibitions are slated for release in 2018, and our decade-in-the-making exhibition and oral history of DOC and the origins of anti-smoking activism will be released in 2019. 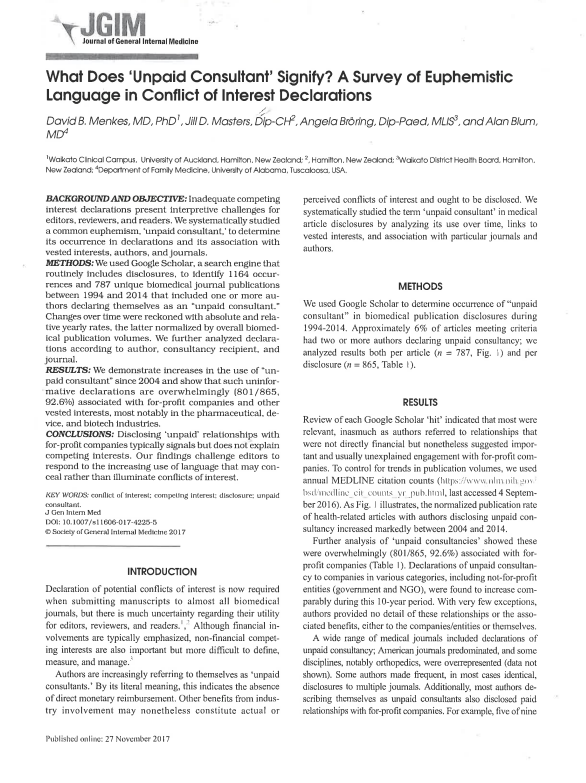 Utilizing the lessons learned from nearly five decades of attempting to counter the use and promotion of tobacco products, in recent years I have mentored student research projects to address the parallel rise in tanning bed use and malignant melanoma in young women (The Tanning Bedlam Project); the increase in alcohol marketing targeted to college students; universities’ and high schools’ conflicted role in counteracting the increase in adolescent obesity; the lack of knowledge by physicians about electronic cigarettes (The ABCD’s of E-Cigarettes Project), the growing threat to public health by the anti-science, anti-vaccination movement and the re-emergence of once-eradicated infectious diseases(original presentation: Polio: Forgotten but Not Gone), and the deficient understanding on the part of both physicians and college students alike of the health consequences of marijuana. In the past year, University of Alabama Catherine J. Randall Scholar and Computer-based Honors Program premedical student Tom Gruchala and I have created an original research poster, presentation, and website to raise awareness among university administrators, students, and physicians of the alarming rise in digital media addiction and adverse physical and mental health effects among college students–research that was awarded second place in April at the University of Alabama Undergraduate Research Day. I wish to thank the University of Alabama, the College of Community Health Sciences, and our benefactors, advisors, and participants for their ongoing support of this unique historical resource on tackling the single most preventable cause of death and disease of the 20th and 21st centuries. 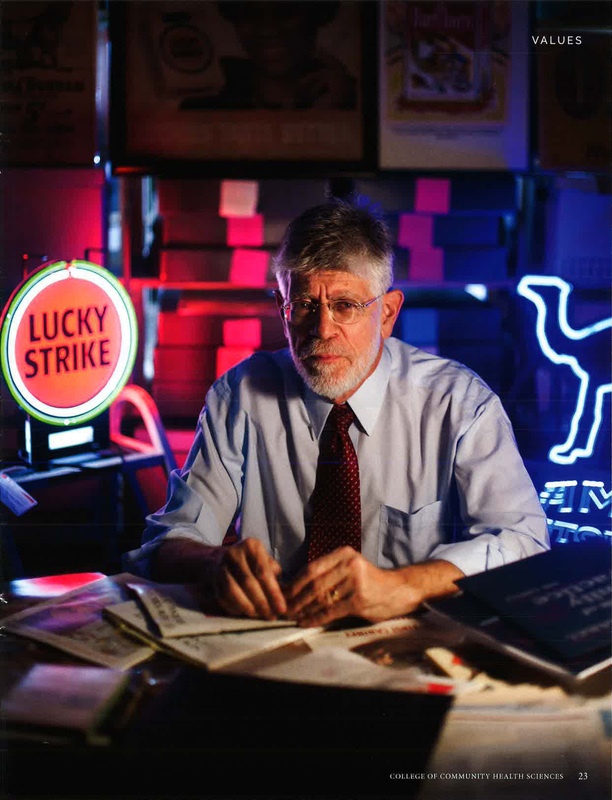 The mission of the University of Alabama Center for Study of Tobacco and Society, founded by Alan Blum, MD in 1999, is to explore, investigate, compare and contrast the historical and contemporary aspects of the tobacco issue and the role and influence of tobacco in society through an interdisciplinary approach that involves research, professional education, and community outreach. The Center for the Study of Tobacco and Society serves as an international resource on tobacco issues. 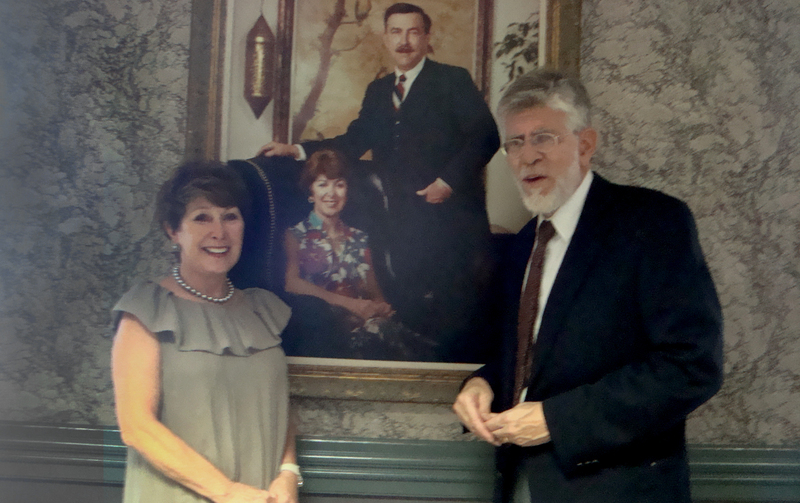 Mrs. Celia Wallace, Alan Blum MD, and the portrait of Dr. and Mrs. Gerald Leon Wallace, at Springhill Medical Center, Mobile, Alabama. 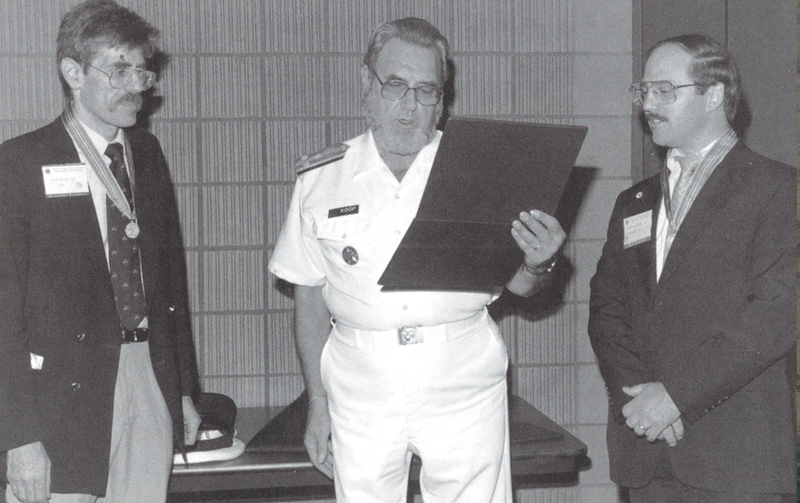 Dr. Wallace, founder of the medical center, was a compassionate and innovative leader in patient care. The University of Alabama Center for the Study of Tobacco and Society is supported by grants from Mrs. Celia Wallace and the Richards Family Foundation. Mrs. Wallace is chair of the board of directors of Springhill Memorial Hospital in Mobile, Alabama, and a leading advocate for disease prevention and community health. Dr. Lee Wallace, PhD, son of Dr. and Mrs. Gerald Wallace, is the chief executive officer of Southern Medical Health Systems the parent company of Springhill Medical Center. Dr. Rick Richards of Augusta, Georgia, is a family physician and medical activist who has created innovative health care cost-containment programs and health-related companies. Blum A. “Big Tobacco in the Big Apple: How New York City Became the Heart of the Tobacco Industry…and Anti-Smoking Activism.” Released April 2018. Blum A., et al. “Wedded to Smoking.” Released May 2018. Blum A., et al. “Of Mice and Menthol.” September 2018. Blum A. “Smoking in the Balcony Only: When Movie Stars Sold Cigarettes.” October 2018. Blum A., et al. “Cartoonists Take Up Smoking.” November 2018. Blum A, Novotny T. The filter fraud: Debunking the myth of “safer” as a key new strategy of tobacco control. 17th World Conference on Tobacco or Health, Cape Town, South Africa. March 7-8, 2018. Blum A. Of mice and menthol: Rethinking well-intentioned but insufficient strategies to counteract tobacco use and promotion in minority populations. 17th World Conference on Tobacco or Health, Cape Town, South Africa. March 9, 2018. Blum A. From anti-smoking activist to archivist… and back again: How exhibitions on the history of tobacco control are helping to educate a new generation: Highlights of Six Exhibitions. 17th World Conference on Tobacco or Health, Cape Town, South Africa. March 9, 2018. Blum A. Ongoing relationships between the tobacco industry and universities: An insidious obstacle to tobacco control. 17th World Conference on Tobacco or Health, Cape Town, South Africa. March 7-8, 2018. Blum A. Reflections on 50 years as an anti-smoking activist: The danger of the single narrative. 17th World Conference on Tobacco or Health, Cape Town, South Africa. March 9, 2018. Blum A, Gruchala, T. Digital media addiction: An emerging problem among college students. University of Alabama System Student Honors Research Day. February 3, 2018; University of Alabama Undergraduate Research Day. April 2018. (Awarded second place); Alabama Rural Health Conference. April 2018. Tsugios L, Blum A. Pet therapy. University of Alabama College of Community Health Sciences Research and Scholarly Activity Day. November 9, 2017. “The Oncologist’s Role in Ending the Tobacco Pandemic.” Oncology Grand Rounds. Tufts University School of Medicine. “Successes and Failures of the Anti-Smoking Movement.” Internal Medicine Grand Rounds. Tufts University School of Medicine. September 15, 2017. “Obesity and the Mass Media.” Noon Seminar. University of Cape Town School of Public Health and Family Medicine. March 5, 2018. “From Anti-Smoking Activist to Archivist and Back Again: How Museum Exhibitions on the History of Tobacco Control are Helping to Educate a New Generation.” 17th World Conference on Tobacco or Health, Cape Town, South Africa. March 9, 2018. “The Philip Morris Genome Project: A Guide to Tracking Alliances of the World’s Largest Cigarette Company.” 17th World Conference on Tobacco or Health, Cape Town, South Africa. March 8, 2018. “Fighting Smoke with Fire: How a Band of Family Medicine Residents Sparked the Modern Anti-Smoking Movement.” University of Alabama at Birmingham School of Medicine Annual Primary Care Week Lecture in Family Medicine, October 6, 2017. “Tackling Tobacco.” Premedical students’ UH 400 Class. October 23, 2017. “Obesity and the Mass Media: The Big Picture.” Premedical students’ UH 400 Class. January 12, 2018. “Advocacy Advertisements in the Print Media.” Professor Jessy Ohl’s Undergraduate and Graduate Class on Visual and Digital Rhetoric. February 15, 2018. Medical Student Didactic Session on Smoking Cessation. July 7, 2017; September 1, 2017; September 29, 2017; February 23, 2018; May 11, 2018. “Overview of the Tobacco Issue in Alabama: Fighting Smoke With Fire.” Alabama Community Health. September 5, 2017. Menkes DB, Masters JD, Broring A, Blum A: What does “unpaid consultant” signify? A survey of euphemistic language in conflict on interest declarations. J Gen Intern Med. 2018;33(2):139-141. Blum A, Berecz H: Smoking in the balcony only: When movie stars sold cigarettes. Marquee (Theatre Historical Society of America). 2018;50(1):18-36. Blum A. Electronic cigarettes. Wall Street Journal. September 15, 2018. https://www.wsj.com/articles/e-cigarettes-arent-the-answer-for-the-young-1505424740. Accessed July 30, 2018. Blum A. 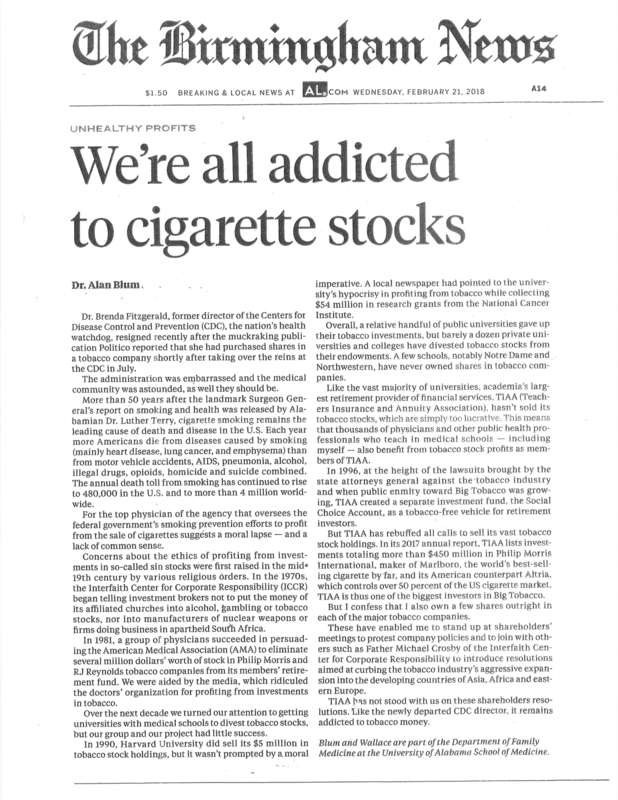 Unhealthy profits: We’re all addicted to tobacco stocks. The Birmingham News. February 21, 2018(A):4. https://www.al.com/opinion/index.ssf/2018/02/it_might_surprise_you_who_else.html. Accessed July 30, 2018. 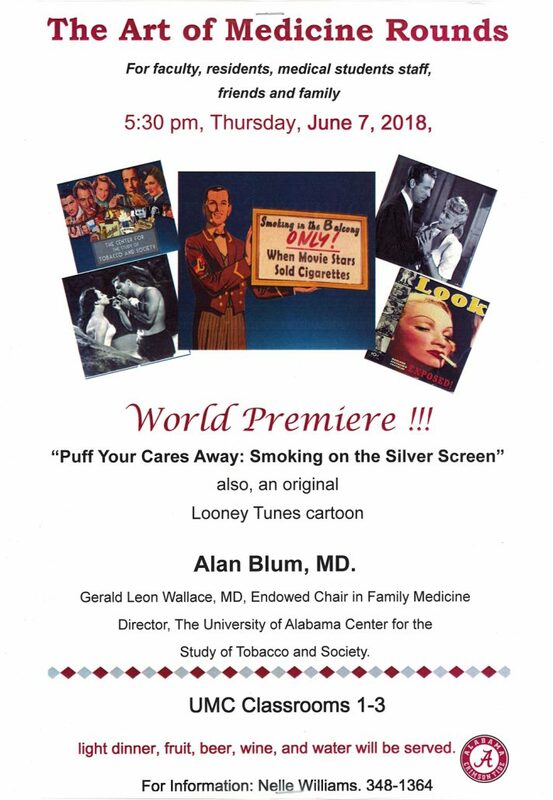 Blum A, Burks C. Puff Your Cares Away: Smoking and the Silver Screen. Premiere at the Theatre Historical Society of America Annual Conference. Detroit, Michigan, June 19, 2018. Previewed at The Art of Medicine Rounds, College of Community Health Sciences, June 7, 2018. Premier screening at the annual conference of the Theatre Historical Society of America, Chrysler Black Box Theatre, Detroit Opera House, June 19, 2018. Use the headings at the top of the section in the gray area to browse the sections of the annual report. The links in the bar above will take you to feature pages of the report.